Until now the large body of socially focused Bengali literature has remained little known to Western readers. 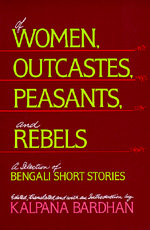 This collection includes some of the finest examples of Bengali short stories—stories that reflect the turmoil of a changing society traditionally characterized by rigid hierarchical structures of privilege and class differentiation. Written over a span of roughly ninety years from the early 1890s to the late 1970s, the twenty stories in this collection represent the work of five authors. Their characters, drawn from widely varying social groups, often find themselves caught up in tumultuous political and social upheaval.The reader encounters Rabindranath Thakur's extraordinarily spirited and bold heroines; Manik Bandyopadhyay's peasants, laborers, fisherfolk, and outcastes; and Tarashankar Bandyopadhyay's rural underclass of snake-charmers, corpse-handlers, stick-wielders, potters, witches, and Vaishnava minstrels. Mahasweta Devi gives voice to the semi-landless tribals and untouchables effectively denied the rights guaranteed them by the Constitution; Hasan Azizul Huq depicts the plight of the impoverished of Bangladesh. Kalpana Bardhan is a research associate at the Center for South Asian Studies at the University of California, Berkeley.